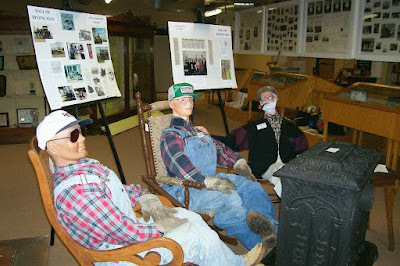 A "Hall of Distinction," located in the loft of the Mitchell County Historical Museum, has been created to honor and memorialize individuals connected to Mitchell County as well as businesses, buildings, churches and services located within Mitchell County. "The Society wants this area to be a learning experience for folks of all ages," said Ellen Elsbury, Musem Chairperson. "This will be forever changing with rotating exhibits and vignettes." * Urban Marr Family and the Marr Knitting Mill. * World War II veterans featuring uniforms, medals, maps, including the uniform and autobiography of Allen Hauge. * Watts Theater projection equipment and early movie banners with new-found information about "Tiny" Sanford, an Osagian who was featured with Charlie Chaplin, and also information about Millie and Jim Watts. * Hamlin Garland, Pulitzer Prize winner, featuring his family, history, books and connections with the Cyrus Button Family. * Santa Claus Richard Lunde, a man known for many, many years as Osage's Santa Claus. His figure sits by his very own fireplace surrounded by wooden toys from the first preschool of Margie Lesch, circa 1935. * David Rottinghaus and his family featuring some of his art creations. 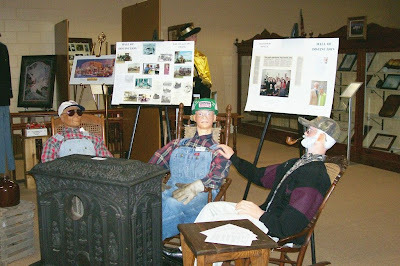 * Smoliks - Ray, Ed and Gary are featured rocking away by the old stove talking Cedar Valley Memories history. In the exhibit, visitors can find a copy of Grandma Smolik's recipe for sauerkraut and dumplings. * Lessard Family and Fox River Mills featuring the now famous "Red Heel Sock Monkey." * Weston Birdsall and the Osage Municipal Utilities - his awards and the history of energy conservation. * Fort Severson and the history of its existence in Mitchell County - exciting Indian lore. * Osage Precisionnaires - Osage's Drum and Bugle Corps along with Doc Crosser. * Mitchell County Safety Services featuring the Mitchell County Sheriff's Department, local police and fire departments - many pictures and past history written by Sheriff Curt Younker. * Judge Lynne Skuster Brady Neuhaus, Class of 1964, becoming the youngest individual to serve on the Iowa Bench at the age of 26 and the first woman to receive the Iowa Judge's Association Award of Merit in 2001. * Mitchell Dam Construction with original pictures donated by Dennis R. Fisher of Mitchell, Iowa. * Harry Conklin Museum and original plant which was located in the third ward of Osage in a chicken coop. * Eloise Halbach Kuper (resident artist of Mitchell County Historical Museum), featuring the lost art of feather painting with step-by-step instruction. * Grace Doris Hoffman - whose father was Cyrus J. Button, longtime friend of Hamlin Garland and resident of Burr Oak. Included are her paintings and genealogy which highlights her nieces and nephews of the Cornwell and Tubbs Families of Mitchell County. Featured is correspondence related to her portraits of J.F. Kennedy and Lyndon Johnson. "This is an area of education and place to just savor the fine arts of life in Northern Iowa," said Elsbury. The dedication of this area will take place immediately following the Mitchell County Historical Society's annual meeting Sunday, Nov. 18 which begins at 2 p.m. in the lobby of the Cedar River Complex, located at 809 Sawyer Drive Osage.